There are plenty of heavy bands in the world. Bands that set their amps to shudder and riff into oblivion. Bands with excavation crews instead of rhythm sections. Bands that bring thunder down to Earth. But there are few bands out there that feel like they come upon their heaviness as naturally as Elder, the young Boston-based quartet that has quietly built a killer catalog over the past decade. Their brand of heavy psych-rock feels denser and more decisive than most of their contemporaries. It feels carved out of a mountainside. The band’s core—guitarist/vocalist Nick DiSalvo, bassist Jack Donovan and drummer Matt Couto—have been making music with a laser focus on high-quality songcraft. The result is noticeable artistic growth. Elder steadied itself on its 2008 self-titled debut, then started shedding some of its stoner-rock scowl on 2011’s Dead Roots Stirring. The band’s third album, however, was a revelation. On 2015’s Lore, Elder increased the intricacy of its playing, flexed its psych and prog muscles and evolved into a behemoth of a band that can be both heavy and melodic as effortlessly as most people salt and pepper their food. 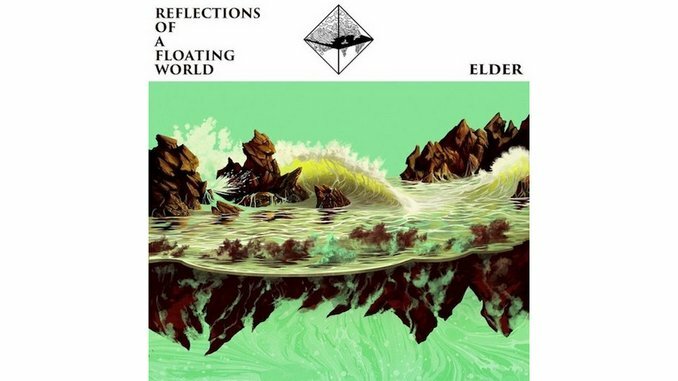 On their new album Reflections of a Floating World, Elder pushes even further outward from their gnarled roots. Four of the album’s six songs stretch past the 10-minute mark; “Sonntag” is the shorty of the bunch at 8:39. The long run-times give Elder plenty of space to wander, as evidenced by opening track “Sanctuary,” which transitions from buzzy crunchbomb (for about three minutes) to space-traveling guitar-sologasm (for another couple minutes) to quietly gorgeous interlude and back to crunchbomb again in time for a skyscraping finale. This is Elder’s specialty. They build and build and build, exploring with confidence even when it means they must follow instinct rather than a beaten path. The first 90 seconds of “The Falling Veil” pulsates gently before the song mushrooms into a ragged rock jam, which then gives way to a coda threaded with a string arrangement. “Staving Off Truth” chugs heavy for half its 10 minutes, then shifts into a swirl of chimes and swoops and a proggy bridge. On “Blind,” DiSalvo dusts off his keyboard, while “Sonntag” is an experiment in Krautrock. Here’s hoping they go further down that rabbit hole on the next LP. But that’s looking too far ahead. For now, let’s appreciate this under-appreciated band for what it is: One of the very best heavy rock attacks on the planet. One that makes it look so incredibly easy, when, in fact, it’s not easy at all.